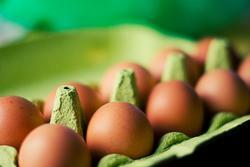 The sale of raw shell eggs sold from your property, at Certified Farmer's Market, grocery stores, restaurants and institutions are covered by this fact sheet. California Department of Food & Agriculture (CDFA) administers this program. Eggs must be from hens under your ownership and care. Complete an Egg Handlers Registration - no exceptions! Everyone selling shell eggs must register. NOTE: as of 1/2019, all species of fowl must register, previously, registration only applied to eggs from chickens. If you will be selling at a Certified Farmers Market, you will also need to complete a Certified Producers Certificate Application. 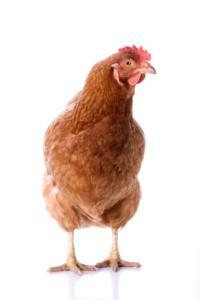 If you have over 3,000 laying hens you must comply with US Food & Drug Administration (FDA) Egg Safety Rule. UCCE Poultry for backyard, small-scale and commercial production operations. Required for chickens: grading, sizing, refrigeration and CASEFS Compliance. Required for ALL: Cleanliness, management claims, and IRQ label requirements. Egg Grading refers to the exterior and interior of the egg. The eggs must be clean and free of major defects on the outside as well as the inside. ALL eggs should be candled to identify any internal defects. Refer to the USDA Egg Grades & Standards for complete instructions. Grade AA: The shell must be clean and unbroken. The air cell is limited to 1/8 inch depth at original and 3/16 inch at destination. The white must be clear and the yolk practically free of apparent defects. Grade A: The shell must be clean and unbroken. The air cell is limited to 3/16 inch depth at original and 1/4 inch at destination. The white must be clear and the yolk practically free of apparent defects. Grade B: The shell must be clean and unbroken and may have unlimited slight stains (but not dirt clinging to shell). The air cell may not exceed 3/8 inch. The white must be clear and the yolk practically free of apparent defects. The white may be weak and watery and the yolk outline plainly visible the yolk may appear dark, enlarged and flattened. It may show other serious defects which do not render the egg inedible. The grade of a shell egg is determined by the size of the internal air-cell. As an egg ages, the liquid contents evaporate through its pores. The larger the air-cell is, the lower the grade of the egg. The outside appearance also factors into the grade of an egg. Eggs with moderate staining (but not adhering dirt) can be sold as grade "B." All other grades require a clean, unblemished shell appearance. Dirty eggs cannot be sold to consumers. The size of an egg is determined by its weight, in grams. A small egg must weight 40.16 grams or more, a jumbo egg must weigh 68.51 grams or more. The consecutive date of the year on which the eggs were packed. Example: Jan 1 = 001, Jul 1 = 182, Dec 31 = 365. One size and grade shall appear upon a container. Size and grade shall be plainly marked in letters not less than 1/4 inch in height. "CASEFS COMPLIANT" must be 1/4 inch in size. Descriptive terms such as polyunsaturated, plus polyunsaturates, higher in iodine, flavored with iron, omega 3 or other wording indicating a quality or ingredient different than found in a normally produced egg may not appear in labeling unless approved by the Agricultural Commissioners office. 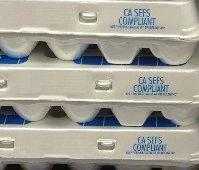 CDFA recommends NOT re-using egg cartons because of health risks. The terms cage free and pasture-raised are currently unregulated. USDA requires that in order to use the term free range, producers must demonstrate that the poultry have access to the outside. Labels that claim Certified Humane, Animal Welfare Approved and American Humane Certified all require certification from the respective organizations. the term Organic can only be used if the business/farm is registered organic through CDFA. Registration is regulated by California Department of Food Agriculture through the county Agricultural Commissioner's office. Gross sales up to $5,000 of organic produce/eggs, you can be registered only. This allows you to use the term 'organic' on your label, but you cannot use the USDA Organic seal. Gross sales over $5,000 of organic produce/eggs, you must become third party Certified in addition to the CDFA Organic registration. See CDFA's Organic Program page, scroll to Organic Certifier's List. You must use a CDFA approved certifier. NOTE: If you are unsure of the size of your eggs, label them the smallest size. For example, if you have at least medium sized eggs, label the carton as Medium. It is acceptable to have larger sized eggs in the carton. The refrigeration regulations technically only apply to chicken eggs, however CDFA strongly encourages those who handle other eggs to follow the same refrigeration practices. Raw shell eggs should be held at or below 45°F. The eggs were produced by poultry owned by the seller and collected on the seller's property. The eggs are not placed in direct sunlight during storage or display. Retail egg containers are prominently labeled "refrigerate after purchase" or the seller posts a conspicuous sign advising consumers that the eggs are to be refrigerated as soon as practical after purchase. 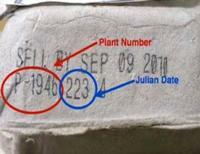 Retail egg containers are conspicuously identified as to the date of the pack. The eggs have been cleaned and sanitized. The eggs are not checked, cracked, or broken. Any eggs that are stored and displayed at temperatures of 90°F or below and that are unsold after four days from the date of pack shall be stored and displayed at an ambient temperature of 45°F or below, diverted to pasteurization, or destroyed in a manner approved by the enforcement agency. Any eggs that are stored and displayed at temperatures above 90°F that are unsold after four days from the date of pack shall be diverted to pasteurization or destroyed in a manner approved by the enforcement agency. Specific information contained herein has been verified by the Sonoma County Agricultural Commissioner Office.